To achieve a thorough assessment of the challenges and solutions in Implant-Prosthetic Therapy, the diagnostic and therapeutic process must be reconsidered and developed into an integrated treatment plan that promotes, firstly, an interaction between the various disciplines to ensure treatment supported by high quality scientific evidence and, secondly, the active participation of the patient. The clinical-scientific community has begun to attribute importance to the aesthetic assessment of the face, leading to the smile and then intraoral evaluation. This type of evaluation will influence the choice of the prosthetic rehabilitation (facially generated treatment plan), broadening the traditional paradigms of the 'ideal' treatment plan, which was limited to exclusively taking into consideration the intraoral, dentogingival and/or dentolabial aspects. An aesthetic chart that can be used for both conformative rehabilitation (not involving labial tissue or the lower third of the face) as well as reorganizational rehabilitation (where a complete aesthetic dento-facial aesthetic restoration is necessary) will be proposed. This workshop will illustrate the management and treatment of complex clinical cases through an interdisciplinary approach in varying degrees of edentulism, integrating prosthetic solutions that best serve the patients' requests. In the extraction site in the anterior zone of the maxilla, the main problem to overcome is the physiological height difference between the oral and facial bone and soft tissue levels. To compensate for this, a sloped implant has been developed with a height difference of the implant shoulder of approximately 1.5 mm to support the peri-implant structures circumferentially. Intraoral Scanner how powerful are they today? Which systems are best suited for which applications? When to switch from conventional to digital impressioning? 1) What is your favorite benefit of the digital workflow in dentistry beside the discussion about precision of intraoral scanners? 2) Where are the limits today in digital dentistry and is there a difference between reconstruction on natural teeth or on implants regards to data transfer and precision? 3) Will guided implant placement or guided tooth preparation be established as a standard procedure in the near future? And if yes, who will guide the procedure - the robot or still the dentist? 4) What exactly do you understand under a dynamic digital procedure in implantology? What kind of material and which production process will be established? Do we still need implant companies in the future? Oral Implantology and Implant Prosthetics is the field in dentistry where all available digital technologies come together. The CBCT scan, the Intra Oral scan, the Extra oral Scan, tracking systems and software; they all come together in Oral Implantology and Implant prosthetics. The question that comes up then is how precise are these systems and can we really depend on them if we integrate them all into our daily practice. Are these tools just gadgets or can we expect a return on investment both financially but also in our job satisfaction and treatment costs for our patients and why haven't all the dental practioners invested into these systems? How precise is an IO scan but more over how precise does it actually need to be? Can we just download these scans into the different software packages and combine them with CBCT scans without taking possible precision errors into account? If we design a drill guide and mill or print it how precise is that tool then? What other sources of error do we need to think of when looking at deviations in the drilling direction and implant depth. Would 3D navigation be a better approach than working with drill guides? Digitally designed and manufactured dentures. And what does the future have in stall for us? The first crowns on implants and natural teeth have now been designed, printed in composite materials that can be used in the mouth on a long term basis and placed into patients mouths at ACTA. Zirconia and other ceramic 3D printed crowns are being printed and tested by our Phd students as we speak. But how precise is this printing technology? If we can print crowns and bridges then why are we not printing implants? And then, will we print them in titanium, zirconia or maybe totally different materials? Is this type of disruptive technology a threat to dentists, dental technicians and the whole implant/prosthetic industry as such or will this bring benefits for our patients and us as professionals? 1) What do you understand exactly under a virtual patient and where are the clinical benefits and outcomes regards to that "new way" of digital dentistry? Do you believe clinicians need to consider these techniques for their daily work? Where do you see the future and when? 2) How do you transfer functional aspects by reconstructing teeth with a change of the vertical dimension with a digital workflow? 3) What do we do with all these new procedures in digital dentistry and how can we match them together to become functional, predictable and easy to use? 4) Do you believe that intraoral scans will be replace conventional impressions and if yes when? Dr. Greggory Kinzer D.D.S., M.S.D. How has technology influenced orthodontics? 1) Do digitally fabricated brackets and wires produce better results and increased treatment efficiency? 2) Does the decrease in treatment time justify the cost of utilizing technology that fabricates custom brackets and wires? 3) How does Invisalign's digital technology, especially the 3D controls within clin-check, influence the efficacy of this method of orthodontic treatment? 4) When should Invisalign treatment be recommended and who should be doing it - orthodontists or general dentists? Why? How important are ortho-surgery procedures for comprehensive treatments? 1) Is corticotomy a technique to speed up orthodontic treatment? 2) What are its main indications and in which situations it cannot be applied? 3) When is tissue augmentation indicated? 4) Does it always require flap elevation or are there less invasive alternatives? Dr. Jim Janakievski D.D.S., M.S.D. 1) Where do you see the current etiology of periimplant diseases? 2) Do the etiology influence your treatment plan concerning the prevention and management of soft and hard tissue around implants? 3) Which parameters guide you as a clinician to remove an implant affected by periimplantitis? 4) Do your experiences with failed augmentations of buccal dehiscence influence your common procedure in implantology? Are regenerative procedures on implants predictable? 1) What kind of regenerative techniques in periodontal compromised teeth are still predictable compared to implant therapy? 2) What is the endpoint of periodontal therapy in aesthetic cases? Which timepoint, which residual probing depth, which interproximal hard- and softtissue loss do you accept as limits in aesthetic areas? 3) If teeth will be saved, how is your prosthetic concept and how do you handle the interproximal dilemma? 4) What is your therapy concept following tooth extraction before placing implants? When you remove teeth (single or multiple extraction) which kind of techniques do you prefer to create a proper implant bed (immediate - delayed)? The actual challenge is to describe the etiology of periodontitis and periimplantitis and how relevant the role of the biofilm seems to be? Do we have to focus on clinician related factors or more on infection related factors due to the process of bone loss - or are there any other aspects to be discussed? Prof. Dr. Daniel H.-J. 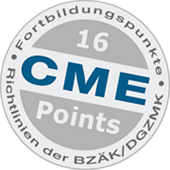 Edelhoff, Prof. Dr. Hannes Wachtel, ZTM Enrico Steger, Dr. Vince Kokich Jr.
Dr. Jim Janakievski D.D.S., M.S.D., Dr. Greggory Kinzer D.D.S., M.S.D., Dr. Vince Kokich Jr. Achieving esthetic excellence in the debilitated dental patient is one of the most challenging tasks dentists undertake. These patients often require dental treatment to correct specific anterior esthetic and functional discrepancies such as missing or compromised teeth, over-eruption of opposing teeth, extreme occlusal wear, loss of periodontal attachment, or a combination of these. Therefore, planning treatment is difficult and requires coordination of care between multiple clinicians to achieve an optimal functional and esthetic outcome. This lecture will illustrate the importance of interdisciplinary interaction between the restorative dentist, orthodontist, and periodontist. It is designed to demonstrate a systematic approach to diagnosing and treatment planning multiple esthetic dilemmas that are encountered in practice every day, while providing the tools and techniques needed to complete treatment. Drs. Janakievski, Kinzer, and Kokich will place a special emphasis on treatment planning, communication, and sequencing. An ideal treatment plan can often be created only by recourse to a team effort involving the concerted action of various specialists. The cooperation with the orthodontist, the periodontist, the implant clinician, the oral and maxillofacial surgeon and the dental technician is often a determining factor, in the successful outcome of the most complex prosthetic cases. The presentation will discuss the fundamentals required to accomplish a pleasing, functional and long lasting esthetic outcome: understanding of the patient's needs, hierarchy of decisions, treatment plan, team collaboration, and selection of restorative materials. In simple words : Who does What and When. Thanks to digital technology it is possible to simplify many steps necessary for the Ortho Surgical Planning, for minimally invasive rehabilitation, thus improving furtherly the predictablity of the success of the treatment. The increase of the vertical dimension of occlusion enables the restorative dentist to idealize the esthetic and functional parameters with only a secondary involvement of the orthodontist. In other situations the Ortho Surgical intervention is necessary to answer the Chief Complaint of the Patient and the Restorative work will address the final aesthetic and functional occlusal problems. The MIPP (Minimally Invasive Prosthetic Procedure) technique guarantees the maintenance of a maximum amount of enamel and the use of the appropriate bonding technique ensures a remarkable resistance and a long lasting result to the prosthetic extensive rehabilitations. The Orthodontist needs to position teeth so that they can be treated with Prep less or No Prep Rehabiltations. To ensure quality outcomes it is necessary to proceed on three levels of action: Position of Teeth and Jaws, Shape of hard tissues and Enhancement of soft tissues. Both the face and the smile macroesthetics and dental microesthetics are relevant.